Pollen is the male reproductive cells of plants (pollen) of Spermatophyta. In plants that have flowers, pollen grains are found on the anthers of stamens and then transported to the pistil, so that the fertilization of the flower will take place. The thickness of the pollen grains ranges from 2.5 to 250mm (microns). Their color varies from the black color of the seeds of poppy, pink – red of knotweed, light- yellow of dahlia until the white of cotton. The taste of pollen are most bitter but there are plants, usually herbs which give sweet pollen. The wind- plants fertilization is mostly random and for this purpose produces more pollen and smaller size granules to travel kilometers away with the help of the wind. These plants base their fertilization on insects (bees, butterflies, etc) .The pollen during the pollination of bees mix with their secretions and nectar.The combination of these components is responsible for the beneficial features of the pollen which are offered to the human. Pollen is an essential food source for bees because of the wealth of nutrients it contains. More particularly it contains high amounts of phytochemicals substances and secondary metabolites. The use of pollen was widespread in ancient times worldwide. This is attributed to its pharmacologeutical properties which were known ever since many diseases are treated with the use of pollen. Some of these illnesses were colds, flu, ulcers, premature aging, anemia and colitis. Even today, the use of pollen is widely known and it has been noticed a steady increase in the use by people as a food supplement or as a tonic. Aimed at both small age groups and older ones it offers wellness and it has anti-aging features. The main ingredients of pollen are lipids, sugars, proteins, vitamins, carotenoids, amino acids, polyphenols such as flavonoids and carbohydrates. Some of the therapeutical features are attributed in some of these ingredients attributed ingredients area. A recent study has assessed the chemical composure and biological activities of the Greek pollen and the results have shown that its main components are the sugars, fatty acids, phenolic acids, flavonoids, the esters of fatty acid and palmitic acid. It has been noticed protea some activity in human fibroblasts , which has beneficial effects on cells which are subjected to oxidative stress and in addition contributes to the prolongation of lifetime. Experiments have found that pollen ingredients exhibit have shown antimicrobial activity because they inhibit the growth of bacteria and pathogenic fungi. This action could be attributed to the high content of flavonoids. Pollen having the chemical composure of a large amount of flavonoids and phenolic compounds, has a high antioxidant power, and it helps remove free radicals in the human body. Carotene, which is the main source from which vitamin D is produced. Rutin (vitamin P) which strengthens and helps in growing capillaries circulation not to mention that it reinforces the veins and arteries. This is a property that contributes to a large extent as it protects you from heart attacks and strokes, especially for those who are their forties and older. Melissogyri still contains an amount of enzyme components necessary for digestion and absorption of food through the digestive system of the human body. And also plant hormones which are harmless to humans ( and not like the harmful synthetic hormones produced in laboratory industries and are sold in pharmacies that arrange and regulate the secretion produced by male and female endocrine glands , in this capacity and strengthens the prostate. Regular use of melissogyris normally brought by the hive bees (and not adulterated, stale or spoiled) can restore the prostate its old youth, as experiments have proved. In Sweden and the Nordic states people consume astonishing amounts of melissogyris. It is said that it leads to the regeneration of their sexual strength. Melissogyri has great impact on women, particularly in the various difficult periods of their lives. When they get it mixed with honey it results in their ability to alive birth easily. Most importantly though, its use contributes to have nice quiet and smiley babies. 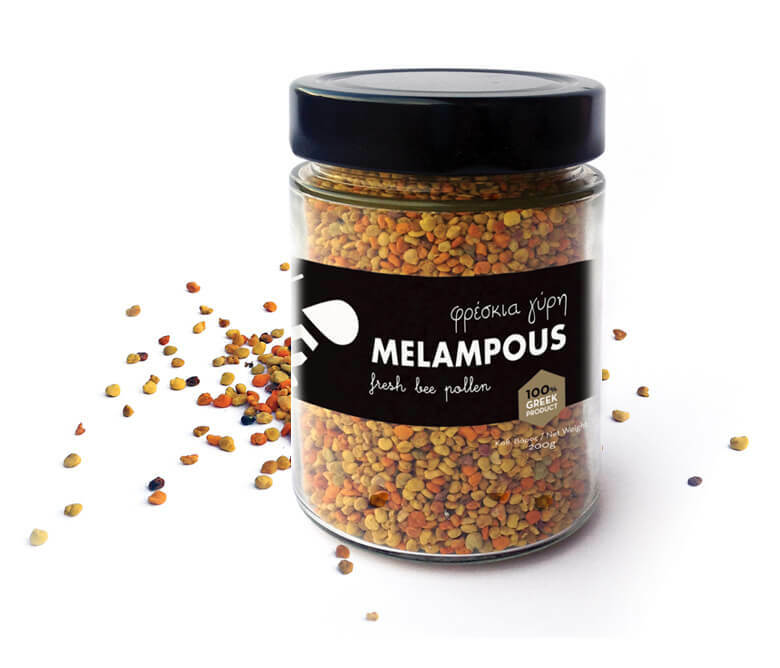 Greek pollen is of excellent quality, because nothing can be compared with Greek flowery herbs. It is the richest natural food in proteins, vitamins, essential amino acids, hormones, enzymes minerals and others. The balance of amino acids is a determining factor of the nutritional value of pollen. It contains more than 5000 enzymes and co-enzymes necessary for the metabolism of food and absorption of nutrients from the digestive system contains antibiotic and bacteriostatic substances and plant hormones that regulate normal secretion of endocrine glands. If we compare the content of pollen in amino acids with corresponding to beef, eggs or cheese, you will see that in an equal weight of pollen it is 5-7 times richer than those foods that are known for their nutritional value. The integration of the human daily life brings incredible results. Pollen gives euphoria and increased self-confidence. The pollen helps mental function, strengthens the contraction of the heart, has a diuretic effect, corrects the balance of metabolism and contributes not only to the reduction of weight but also the increase of it. It is increase the metabolic rate of the ethanol, intense sexual activity, substantially reduces the problems of menopause and anemia, prostatitis, haemorrhoids, constipation, diarrhea and enteritis, it contains an antibiotic substance, similar to the penicillin which affects the metabolism of the water, deposition of the thyroid gland fat and protects eyesight. It is consumed as such as it, is dissolved in a juice or mixed with honey.